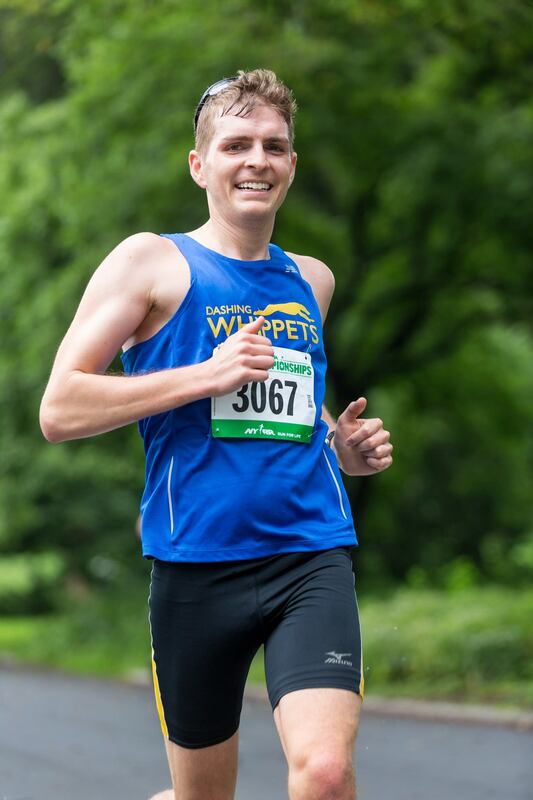 Whippet stalwart David Parkinson’s recap of his big PR at the Chicago Marathon. He killed it, so enjoy! In April I ran my third sub-3 marathon in Boston, coming across the finish in 2:58:56, slower than my 2013 Chicago time, but a big Patriots Day PR. I was thrilled but knew I wanted to run faster in the fall. I spent the summer training harder than ever before–I had seven weeks at 70 miles or more–yet never felt overwhelmed. I had lots of great individual workouts and even PR’ed in the 10k. Nevertheless, I had a very conservative goal going into Chicago–2:57:59, a 14 second PR. As always, I did a three week taper which means that my last hard long run was the Whippets’ Metric Marathon, which went really well. Still, there’s roughly a 10 mile difference between 26.2k and 42.2k and as anyone who’s run a marathon can tell you, a lot can happen in the last 10 miles. The Saturday before the race, Meredith and I invited all Whippets running Chicago over to our place for a carb-heavy dinner and a chance to talk race strategy. It was good to do something on the New York end because it was much harder to coordinate something pre-race in Chicago–I would definitely recommend doing this next year. Mer and I flew out on Friday night. Our original flight was super late thanks to residual delays from the air traffic control fire a week and a half before, but I was able to work my persuasive magic with Delta to get us on an earlier flight meaning we still got in at a reasonable hour and were in bed by 9:30. I find rest two nights out is key since it’s often hard to sleep the night before a big race. The next morning we got up around 7 a.m.for a shake-out run along the Lakefront Trail followed by our now-traditional pancake breakfast at Wildberry. Note: If you go, make sure to order the cinnamon roll pancakes! After a quick shower, we met Mer’s parents for a trip to the expo. The Chicago expo is definitely better than New York’s, but we didn’t stick around too long since neither of us wanted to tire out our legs. The highlight worst part of the expo was paying $4.50 for a small Powerade. Pro tip: If you go, BYOB! Lunch for me was plain pizza and more Gatorade (I also snacked on bagels throughout the morning–the day before a marathon, I’m pretty much always eating between the time I wake up and dinner). After that, we went back to our Airbnb, got stuff ready for the morning and then took a nap. We regrouped with Mer’s folks at 5 p.m. for a pasta dinner at Topo Gigio where I paired my fresh noodles with the finest non-vintage red (Gatorade, of course). Thanks to our early dinner time (I try never eat later than 5 p.m. the night before a marathon to give the food plenty of time to digest) we were able to get to bed by 8 p.m. or so. I actually slept pretty well (thanks klonopin! ), though all the Gatorade/Powerade/Nuun I drank during the day ensured a couple of bathroom visits. Our alarm went off at 4:45–a compromise time since I wanted to get up at 4:30 and Mer wanted 5–I sprang into action, toasting a bagel for each of us and slathering them with peanut butter. We turned on the news while we got ready for any last-minute weather updates. Thankfully, our Airbnb was right next to Millennium Park so we were able to delay leaving until 6:15 a.m.
Mer and I found fellow Whippets Steve and Francesca near the bag check and with about twenty minutes to go we split up and Steve and I went to Corral A. Since we were in the same corral and he was aiming for a sub-3, we decided to start out together. Compared to the cannon that starts the New York City Marathon, Chicago’s starting gun is pretty anemic, but the result is the same. I always try to run a slow first mile since the crowds and the excitement make it all too easy to go out too fast. Steve and I managed to rein it in and did the first mile in just over 7 minutes. We picked it up on the next two miles which carry you through the Loop and large crowds and I clocked the first 5k in 21:!4, a 6:50 pace. A 3-hour pace is 6:52 so we were right where Steve needed to be, though the 3 hour pacer was slightly ahead of us on the course. Somewhere in these early miles I ditched my arm-warmers and gloves. It wasn’t hot but I could feel myself sweating so I figured I’d better nip it in the bud. I was running with a disposable bottle filled with Gatorade (I always carry a bottle for the first few miles of a marathon since the early water stops tend to be extremely congested), and it was great having Steve there since he was able to hold the bottle while I peeled off the arm warmers. Although I had us slightly ahead of pace, the damn 3 hour pacer didn’t seem to be getting any closer. Our miles ticked by pretty consistently and we hit the 10k in 42:21, meaning we’d run our second 5k at a 6:48 pace. About a mile after the 10k the course hits its northernmost point and turns south again, offering the briefest glimpse of Wrigley Field. That turn is a really good mental pick-up, helped by the fact that the next several miles through Boystown (Chicago’s LGBT neighborhood) have some of the best cheering. Once of the highlights was the perfectly synchronized drill team, complete with twirling bayonets. We hit the 15k in 1:03:24, improving to a 6:47 pace, and somewhere around this point we finally passed the 3-hour pace group. I was feeling really good as the course took us through Old Town where there’s an awesome Elvis impersonate who’s there every year (though he was singing Sinatra when we went by). Mer’s parents were waiting around Mile 11 (they had also been at Mile 4) and they gave a big cheer which was another nice boost. Shortly after mile 12, the race crosses the Chicago River for the fourth time and heads back into the Loop and the crowd support begins to build. I crossed the 20k in 1:24:37, a slight and unexplainable decrease to a 6:50 pace. My legs no longer felt fresh, but I was pretty sure I could keep up the pace, at least for the time being. Of course, I got a little carried away by the crowds approaching the half and ran the next stretch fast, with a 6:27 mile thrown in. Steve and I crossed the half in 1:29:02 and I thought we were in great shape. I told him that no matter what, we were both going to re-BQ (we needed a 3:05, which would have meant a 6 minute positive split for either of us to miss the mark and I wasn’t going to let that happen). At the same time, I did the math and realized that I would need a negative split to PR, but I tried not to think too hard about that yet. The second half of Chicago is definitely not as good as the first: it’s less scenic and there are far more dead zones. The first mile or so is very lively thanks to the presence of the “Charity Block Party,” but by the time you get to the Mile 15 turnaround across from the United Center the crowd support is minimal and the shade is non-existent. In my mind, this is where the race really begins since you can no longer rely on others to carry you through. Case in point: Steve and I crossed the 25k at pretty much the same time, 1:45:18 for me, but then I gradually began to pull ahead. The next portion of the course had a few highlights. There was an official cheer zone with loud music and a video screen around mile 16.5 as you turn south on Halstead. I also knew fellow Whippet (and Team Fox superstar) Jennie Kelly was waiting around Mile 17 and it was great to get a shout-out from her. The course then begins its last real westward jog before turning south again for one of its most boring stretches. I passed the 30k in 2:06:17, now averaging a 6:45 pace. Shortly after Mile 19, the course turns east and takes you through Pilsen, a largely Latino neighborhood that always has great music and cheering. It didn’t disappoint this year and it gave me a mental boost as I thought about my strategy for the remainder of the race. I figured I would reevaluate at Mile 22 or so, but for the time being, I would just try to hold the pace. The next stretch took us through Chinatown and as I passed the 30k in 2:26:47, still a 6:41 pace, I was feeling pretty good about my prospects. After you exit Chinatown comes the worst part of the course, a mile along the Dan Ryan Expressway (imagine running along the Cross Bronx or the BQE) with no shade and minimal crowd support. If you can make it through this section, you’re going to finish, no matter what (at least, that’s what I kept telling myself–I hadn’t slowed down, but maintaining speed was taking a lot more effort). Just before hitting U.S. Cellular Field (home of the White Sox), the course turns east and takes you through the Illinois Institute of Technology campus, where there’s a marching band and decent crowds. The band was taking a break when I ran by but it was still a welcome change of scenery. As I crossed Mile 23, I did some easy math and realized I could slow to 7:30 pace and probably still PR which gave me a confidence boost. Somewhere around this point I also heard someone cheering for me. It was only after I passed the cheerer that I realized it was James, Francesa’s boyfriend. That was another needed lift this late in the race. After one last southerly jog, the course finally turns onto Michigan Ave, which it follows almost to the end. I was now counting down streets–they’re numbered and get smaller as you head north–and miles. I crossed Mile 24 with a 6:37 pace and somehow picked it up for a 6:32 Mile 25 (I passed the 40k checkpoint in 2:47:24, averaging 6:39 over the last 5k). With just over a mile to go and a PR within my grasp, I was determined to gut it out. I felt like I was slogging as I made the second to last turn onto Roosevelt Road (the infamous “Mt. Roosevelt,” essentially an on-ramp that would hardly be noticed in a race that’s not as flat as Chicago), passing the 400m to go and Mile 26 signs. Then it was one final turn into Grant Park along Columbus Drive. I gave it what little I had left, watching the official clock tick towards 2:57, and crossed with my arms held high. Somehow I had done it, I had PR’ed with a net time of 2:56:19, an average pace of 6:33over the final 2.2k, and a negative split of1:45. I felt like a million bucks, even if my legs were completely shot. As I waited for Mer to finish, I ran into other Whippets, Steve (who didn’t get his sub-3, but still PR’ed with an impressive 3:02:38), Francesca (who completely killed it with her 3:04:25), and Maria (who also PR’ed with a 3:31:13). Later that evening we all met up with several other Whippets who had run or cheered, capping off a great weekend with some great pizza. Hopefully we can continue this tradition of Whippet PR’s in Chicago next year!